Your customer experience management (CEM) system is up and running. You are actively listening to your customers and have an impressive 20% survey response rate. You’re measuring NPS and CSAT, and real-time alerts are coming in. That’s great! All signs point to a successful Voice of Customer (VoC) program. Do your customers know that you’re actually listening to them? Most CX programs today gather customer feedback data and use it to inform company decisions; but not many are coming back to their customers to let them know that their voice was heard. Every survey response is a chance to either improve on a not-so-great experience, or to reinforce and continue building upon an already stellar experience. Your survey-taking customers are likely out there in the world wondering what ever happened to the feedback they sent you. Making a point to come back to “close the loop” with your customers can reap greater rewards than you might think. Closing the loop with your customer means going a step beyond just gathering and analyzing survey response data. It's about connecting with your feedback-providing customers directly to acknowledge that their voice has been heard. As a Customer Experience Manager at PeopleMetrics, I have the pleasure of working with companies across a range of industries including hospitality, financial services, telecommunications, and aviation. Among my clients, the companies with thriving CX programs and high Net Promoter Scores are going above and beyond the standard practices of gathering feedback by building loop closing into their programs. So what does it take to build a successful closed loop feedback program? First and foremost, it is essential to build out a defined process for loop closing. Loop closing is not just a concept - it requires committed effort, organizational buy-in, and process design. 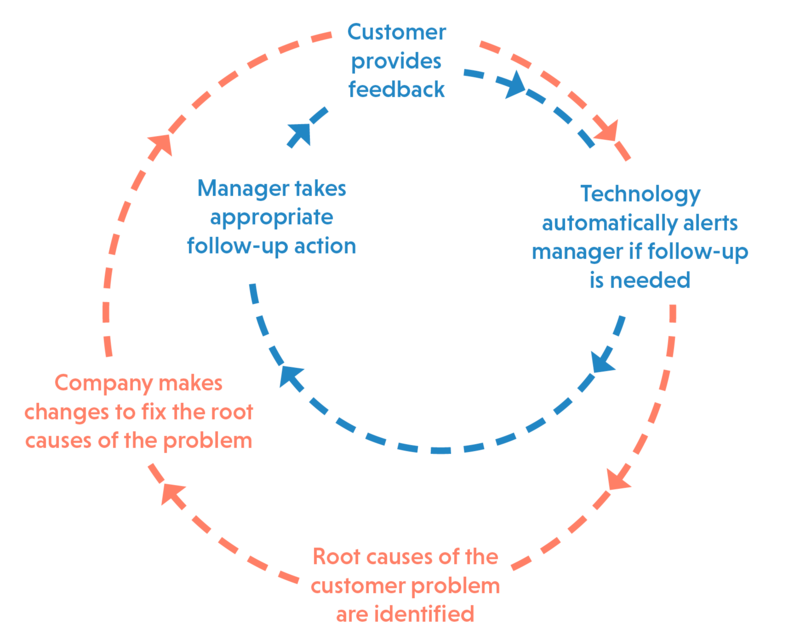 The best closed loop programs define specific workflows for when an alert is received, assigning teams and individuals to reach back out to customers to acknowledge, address, and action their feedback. It is important to identify specific team members who will be responsible for loop closing. These individuals are often called “case managers.” Depending on the size of your program, this could be a single individual or a team. Case managers receive notifications to let them know a “case” or survey response has been submitted. It is their responsibility to then “close the loop” by contacting the customer. This could mean calling to listen to the customer’s story, sending an email or handwritten thank you note, or even reaching out on social media. The most important aspect of the case manager’s position is to seize the opportunity to continue the interaction, and end on a positive note with the customer. Do not delay when closing the loop with customers. The most successful closed loop feedback programs make sure to reach back out to customers within a given time frame - ideally in real-time, but at least within 24 hours if possible. This quick turnaround catches at-risk customers while experiences are still fresh in their minds, and demonstrates the company’s commitment to quickly resolving customer issues. Not to mention, it can turn a great experience into an extraordinary one for customers who provided positive feedback. This final touchpoint can improve NPS and reduce churn by shifting the customer’s lasting perspective of their overall experience. Now that you've successfully closed the loop with your customer, it's time to do so internally as well. Was this a one-off case or part of a larger systemic issue? Address the controllable factors that contributed to the customer's issue and work to close the loop internally. First close the loop with your customer, then close the loop within your organization. Each customer case requiring follow up should also be enriched with some simple tags that help you categorize the primary reason for the case. What was it that drove the customer’s experience? Was it their wait time, staff interaction, or something to do with fees and services? By tagging your customer cases with root causes, over time, you’ll start to see trends, which will help you identify internal aspects of your business that are driving key customer pain points. Use these insights to prioritize and define systemic changes to continually improve your business operations, policies, and processes. I know the power of closed loop feedback programs because I’ve seen the positive results firsthand. A great example comes from one of my hospitality clients. A long time guest was not happy with his resort stay, and knew that it had not lived up to the company’s standards. The guest made his issues known by completing a survey, which generated a real-time alert for the case managers on the company’s loop closing team. The team escalated the guest’s feedback all the way up to the executive level, and the VP decided to close the loop himself by taking the guest to dinner to speak in further detail about the guest’s concerns. The VP and guest had a great time at dinner, and the guest left that interaction saying that his perspective of the company was now better than ever. Of course, the VP of a resort can't take every detractor out to dinner, but the resort's loop closing team can certainly connect with detractors to make things right as quickly as possible. What would have happened if no one reached back out to the guest? The guest would have filled out a survey communicating the issues he had with his stay, the CX program would have taken that data into account, but the conversation would have stopped there, leaving the issue unresolved in the eyes of the guest. This could have very well led to the guest taking his business elsewhere on his next trip, to the ultimate detriment of the company’s bottom line. In this case, escalating the issue to the VP and having him close the loop saved the company a valuable customer. This story is just one example of a loop closing program improving a customer’s experience, but there are countless others. Imagine this type of loop closing every day at enterprise scale. The impact is huge! This is why companies with the best CX programs are not only gathering feedback from their customers, but closing the loop as well by taking action based on the insights they receive. These type of interactions are what inspire me to help my clients create process driven, impactful programs. I know firsthand the difference it can make not only to their customers, but to their business as well. Don't let this be your customer! Audrey Squaresky is a Customer Experience Manager at PeopleMetrics. She works every day to help her clients improve the experience they provide to their customers. Outside of work, Audrey loves concerts, cooking and craft beer.